It is now official that Opera supports crypto activities. The company’s long-awaited desktop web-browser version, Reborn 3, is now available for the Windows, Mac, and Linux operating systems. This browser comprises of an integrated cryptocurrency wallet. It will enable users to explore and interact with the blockchain-based dapps of “Web 3. Furthermore, the wallet lets users send transactions without needing to use an extension like Metamask. To maximize security, Reborn 3’s built-in wallet syncs seamlessly with that of Opera’s mobile Android browser. 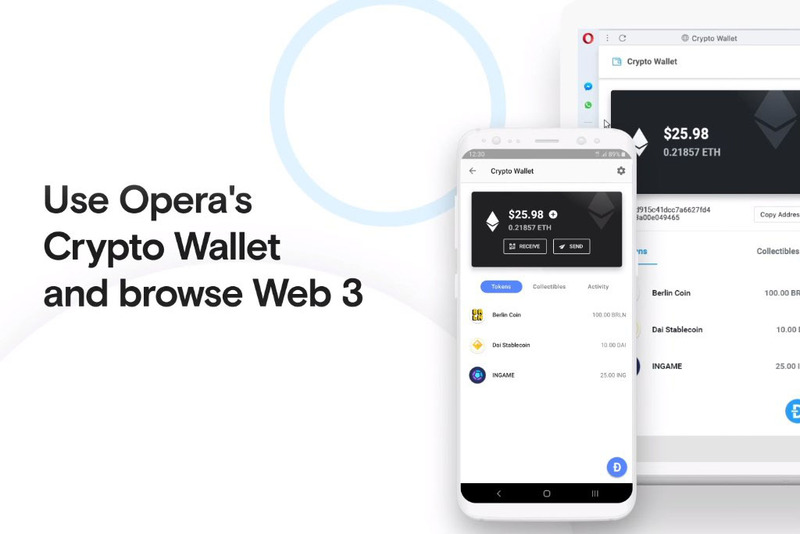 As we reported earlier, the new ‘Opera Web 3.0’ browser with built-in Ethereum Crypto Wallet rolled out on December 13, 2018. It got instant positive feedback. The Norway-based browser maker also launched a marketing campaign to benefit from the EU regulatory order. The order directs Google to allow Android users in Europe to choose their preferred browser. In principle, it seems like a two-factor authentication process. Whenever users want to identify themselves or execute a transaction on the blockchain, they receive a notification on their phone. Unlocking the phone using a fingerprint confirms the said transaction. Opera aims to ensure users’ privacy and security with VPN service integration. The crypto wallet does not need any movement of funds to make transactions on PC. It synchronizes with the cryptocurrency wallet in the Opera Android browser App. All notifications and authentications are handled via a Smartphone. The Opera team gave the browser a visual refresh. The design is borderless letting content to take center stage on-screen. They have both dark and light themes. Opera aims to enable users to do almost everything online in one place. The browser now shapes up with app integration for messengers and more. Opera first highlighted the crypto functionality back in June 2018. As we published earlier, the company launched its first browser with a native crypto wallet. The announcement was made official last August when Opera confirmed that the wallet would eventually reach desktop users. The company tested the new wallet with an exclusive group of beta testers in September. Users can browse blockchain applications by simply typing their addresses into the URL bar directly. The inbuilt VPN will obscure and protect user data from any prying eyes. Back in February, we confirmed that Opera introduced a new buying service for Android Sweden, Norway, and Denmark users. The service enables clients to buy Ethereum directly from its browser-based wallet. Last month, the company announced the forthcoming launch of Opera Touch for iOS. The Touch is a Web 3 browser with an integrated crypto wallet. It supports Ethereum (ETH) transactions and interactions with decentralized applications (DApps).